(From company literature) Nikon’s long legacy and expertise in optical engineering is substantiated with the new 1.4x AF-S Teleconverter TC-14E III that retains the lens’ image quality, even at wide-open apertures. This new teleconverter effectively multiplies the focal length of many NIKKOR lenses by 1.4x, while resulting in only a one-stop loss of exposure. Especially useful for nature and sports photographers, the enhanced optical system reduces chromatic lens aberration, while preserving the accuracy of the AF system. 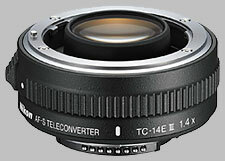 The Nikon 1.4X AF-S TC-14E III doesn't have any user reviews yet!